Here you will find all your Encapsulant needs. We carry multiple/all types of encapsulants such as fungicidal and waterproofing. If you can't find something you are looking for, please give is a call at 1-800-227-8479. 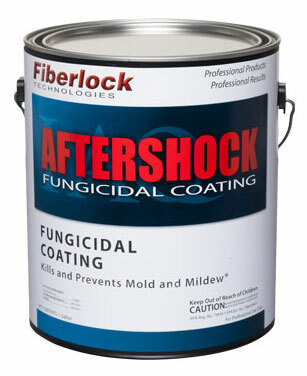 Fiberlock's AfterShock is an EPA-registered antimicrobial coating designed to kill residual mold and mildew remaining after pre-cleaning contaminated surfaces. AfterShock also inhibits the future growth and spread of mold and mildew on the cured film surface in residential and institutional buildings. This extremely durable, easy to apply, 100% acrylic sealant offers the ultimate in durability in combination with excellent fungicidal characteristics to address mold growth from water damage. AfterShock is recommended for use on interior wall surfaces such as plaster, wallboard, drywall, concrete, masonry block, wood, primed metal and galvanized metal. AfterShock is also recommended for use on interior wood framing, primed metal, concrete, and wallboard inside the wall cavity. Comes in 1 gallon cans and 5 gallon buckets. 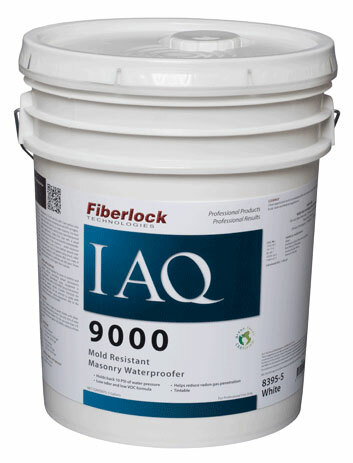 Fiberlock IAQ 9000 is a low-odor waterproofing coating that is specially formulated to stop water from penetrating through a variety of interior and exterior surfaces including above or below grade masonry walls, cinder and concrete block, stucco, brick, retaining walls, and foundations. This latex based formula stops 10 psi of water pressure and reduces radon gas penetration. Fiberlock IAQ 9000 contains an EPA-registered fungicide to help prevent mold from growing on the surface of the cured film. This fast-drying formula may be applied easily with a brush and/or roller on dry surfaces and cleans up easily with soap and water. Fiberlock IAQ 4000 is a rust inhibiting 100% acrylic latex metal coating for use on ferrous metal, galvanized metal and other surfaces exposed to general industrial and atmospheric conditions. 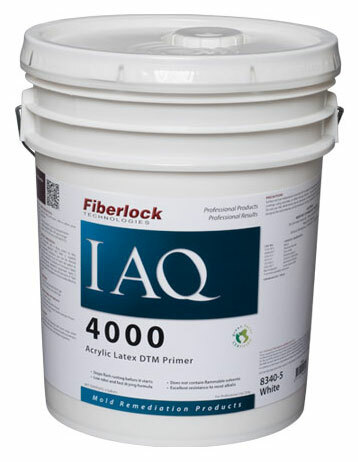 Fiberlock IAQ 4000 has excellent water resistance and excellent resistance to most alkalis, detergents and mild acids. This acrylic latex metal coating does not contain the flammable solvents contained in other rust inhibiting paints, has low odor and fast recoatability. Fiberlock IAQ 4000 is ideal for coating both new and previously painted roof decks, metal paneling, structural steel, corrugated metal siding, and miscellaneous iron and bar joist. When high costs make asbestos removal an unsuitable choice, you can manage asbestos in-place through encapsulation. A-B-C Asbestos Binding Compound, our flagship product, is the world's most successful encapsulation solution. This highly effective, industry-standard, high-solids encapsulant meets Environmental Protection Agency guidelines. It's ideal for sealing in asbestos-containing material, as laboratory tests have shown. The EPA recommends you apply two coats for maximum effectiveness. Dilute the first coat with water so it can penetrate and bind the asbestos-containing material. Then apply the second coat at full strength. A-B-C completely encapsulates all fibers beneath a flexible, impact-resistant seal. A-B-C can also be diluted to perform just about any asbestos control task, from encapsulation to pre-removal wetting or room misting to post-removal lockdown of asbestos fibers. 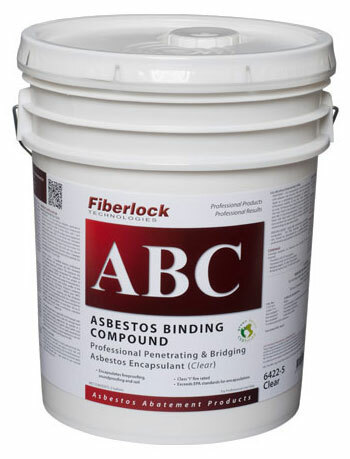 A-B-C Asbestos Binding Compound is a high solids asbestos encapsulant, designed to encapsulate and seal friable Asbestos Containing Material (ACM) such as fireproofing and insulation materials. A-B-C is an important tool for coping with the health hazards associated with exposure to asbestos fibers. In 1978, A-B-C was tested for the EPA by Battelle Laboratories of Columbus, Ohio, and found to meet the requirements for the effective encapsulation and removal of ACM. In addition,A-B-C received German approval following a thorough evaluation conducted at the University. The high solids, nonflammable composition of A-B-C allows for dilution with water to provide maximum flexibility for specific asbestos abatement needs, including removal/lockdown, penetrating encapsulation and bridging encapsulation. Since 1978, A-B-C has provided exceptional long lasting performance in asbestos abatement worldwide. Dry Time @ 77°F, 50% R.H.: To touch 1-2 hours Full cure, 12- 24 days. 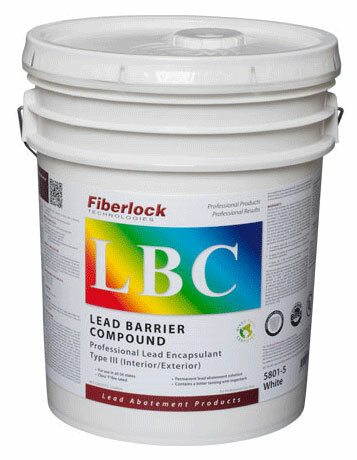 L-B-C is a high-solids, elastomeric-thermoplastic, water-based copolymer that meets or exceeds all projected federal, state and local standards for lead-based paint encapsulants. Blended specifically to form a durable and flexible encapsulant barrier between lead-based pain and the environment, L-B-C has been independently tested to the ASTM E-1795 requirements for Category III (Type III- Interior/Exterior) encapsulants. E-1795 is the principle performance standard required, adopted and/or incorporated by reference into lead paint abatement rules and regulations at the federal, state and local levels. L-B-C has been certified by Massachusetts (No. DL-12362), authorized by the states of Connecticut, Ohio, New York, Maryland, Minnesota, and Colorado. L-B-C is accepted for use in all 50 states. L-B-C has also been classified by Underwriters Laboratories (UL®). L-B-C is environmentally friendly and complies with all federal and state VOC requirements. 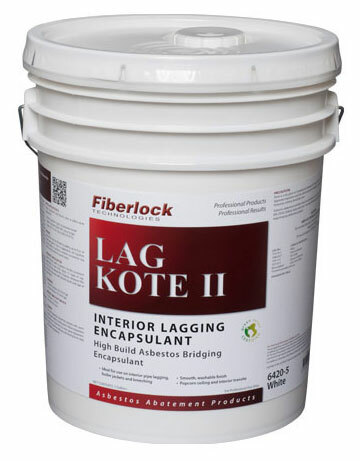 Lag-Kote is a 100% acrylic, high-solids encasement/encapsulation coating, specifically formulated for application over a variety of asbestos containing materials. Tested and EPA accepted at Battelle Laboratories of Columbus, Ohio, under EPA Contract #68-03-2552-T2005, Lag-Kote was found to be an acceptable encapsulant. Lag-Kote was designed to encase asbestos-containing spray-on fireproofing, transite, and thermal insulation. Lag-Kote's viscous formulation minimizes dripping, clean-up and product waste. Lag-Kote provides a smooth, washable, aesthetically superior finish that will provide years of lasting protection. Lag-Kote has excellent resistance to alkalis and can be applied directly over galvanized metal, ferrous metal, masonry or other sound surfaces. UV inhibitors make Lag-Kote suitable for encasement of exterior asbestos containing materials including transite. Lag-Kote is water-base and non-toxic. Lag-Kote is a 100% acrylic, high solids encasement/encapsulation coating specifically formulated for application over a variety of asbestos containing materials (ACM). Lag-Kote is an EPA accepted coating for the encasement/encapsulation of ACM. It was tested at Battelle Columbus Laboratories of Columbus, Ohio, under EPA Contract. #08-03-2552-T2005, and found to be acceptable as an encapsulant. Designed to encase spray-on fireproofing, asbestos-containing plasters and paints, transite, and asbestos-containing thermal insulation, Lag-Kote’s viscous formulation minimizes dripping, clean-up and product waste. Lag-Kote provides a smooth, washable, aesthetically-superior finish that will provide years of lasting protection. Lag-Kote has excellent resistance to alkalis and can be applied directly over galvanized metal, wood, masonry or other sound surfaces. UV inhibitors make Lag-Kote suitable for encasement of exterior asbestos containing materials. Lag-Kote yields an opaque, bright white finish, or can be factory tinted to meet specific color requirements. Lag-Kote is water-based and non-toxic. Weight per gallon @ 77 degrees F: 11.7 lbs. Fire Rating ASTM E84-81a: Class "A"